Every once in awhile, a movie exceeds the expectations set by the trailers. 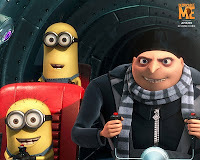 When I first saw the clips of Despicable Me last fall, Universal Studios' first foray into the computer-animated realm, I thought to myself: what is this piece of crap? I had no intentions of seeing it. Another kids film that demeans its adult audience and insults the intelligence of our children, I thought. Also, the previews didn't give a very clear picture of what precisely the film was even about. Villain against villain? Stealing the moon? But where do these cute little girls come in? If the trailers, like the movie posters, had shown more clips of the adorable minions, perhaps I would've been more intrigued. Which is why I was surprised when the reviews of Despicable Me, directed by Pierre Coffin and Chris Renaud (Ice Age films)showed that it was not, in fact, despicable. Well. Being the critic that I am, it was up to me to get to the bottom of this. With my $13.50 in hand and my brain primed for pure analysis, I went and saw what there was to see. Turns out there was a lot. So much, in fact, that I didn't feel comfortable doing a full-on review of this film until after having a second helping. One welcome change was seeing 3-D that was purposefully done, not a gimmick tacked on as an afterthought to satisfy the latest craze (i.e. Tim Burton's Alice in Wonderland.) I'm not sure the sheer giddy joy of Despicable Me could be properly replicated without it, as minions bounce through the air, rockets go off, and all manner of colorful gadgetry crawls toward you, freed from two-dimensional bonds. But paying twice for good 3-D is something that I can only bring myself to do if the actual plot and characters of the film are compelling. 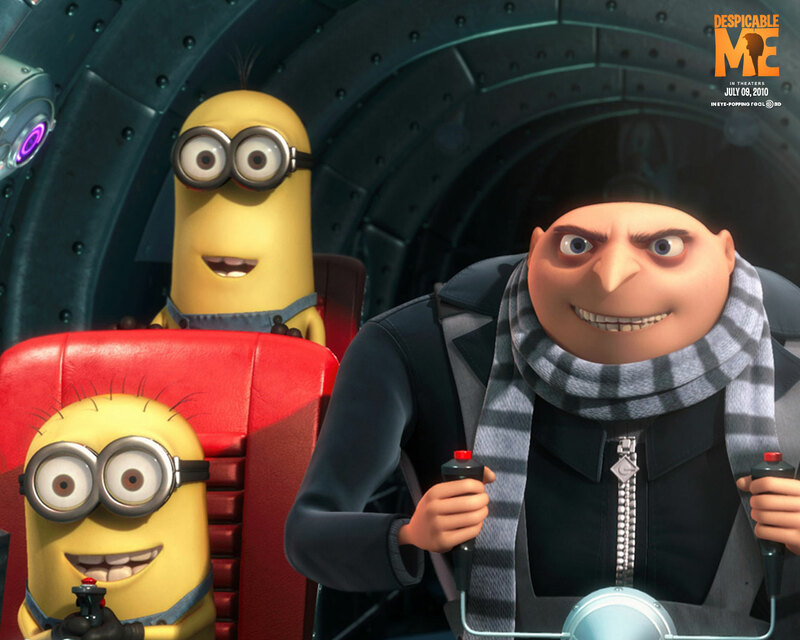 Gru is voiced by the ever-versatile Steve Carell, who gives the villain with the soft heart a very thick accent, somewhere between Hungarian and Russian. There are elements of the Addams Family in his look, style, and certainly in his house - he might be the third brother of Gomez and Fester. Repulsive in some respects but rather debonair, like any good villain, there is something irresistible about Gru. His minions, which easily could have become annoying vapid fodder to satiate the kiddies, have individual personalities, an evil edge, and are rather sophisticated for being cute-as-a-button medicine capsules in overalls. The way they love Gru and come to love the little girls that come into his life is sincere and altogether, heart-melting without becoming soppy. There are details a-plenty to look at that take a second viewing to really see and get, such as the "Gru-ray" logo on the sound system that one of the minions operates towards the end of the film. And groan-inspiring puns become devices for fun sequences, such as when Gru's associate Dr. Nefario (voiced by Russell Brand) makes a series of "Boogie robots" rather than "Cookie robots." And the level of detail, particularly to the textures of clothes and hair, is stunning. The voice actors in this film (Julie Andrews makes an appearance, and I dare you to spot her) are so far into their characters it's impossible to pick them out, which allows for further enjoyment of being immersed in this little world that very quickly goes other-worldly. There are moments where Despicable Me walks the knife-edge, almost dipping into the realm of cloying over-sentimentality, but in those moments the words ring so true we can allow ourselves to inwardly go "awwww" rather than "oh brother." And the back story - a young boy with a dream who wants to have the moon for himself - compliments the tale rather than hindering it with yet another stale child back story. This time, we actually CARE. Do yourself a favor and go see something fresh and original. And tell me if you don't want to just take one of those little minions home with you by the end of the film! Stay for the credits, and be sure to download the IPhone App (if you have one of those things) to translate what the minions are saying. If you don't have one, it's still hilarious.